Merrell’s line of reliable trail gear, including the new Thermo Rogue Mid GTX winter hiking boot, helps adventurers around the world savour the joy of the great outdoors. Merrell is on a mission to provide outdoor enthusiasts with the gear they need to discover the simple yet profound power of the trail. For over three decades, Merrell has been producing rigorously-tested work boots, hiking boots, trail running shoes, active lifestyle shoes and apparel that inspire enjoyment of the outdoors. It all started when Randy Merrell, a one-time industrial shoe-maker, began crafting handmade hiking boots for a small group of customers. In 1981, Merrell teamed up with former ski company executives Clark Matis and John Schweizer. Merrell’s thoughtful craftsmanship, combined with Matis and Schweizer’s industry expertise, allowed the trio to create a more affordable model of Merrell’s custom hiking boots that was an instant hit with sport enthusiasts. Today, Merrell is one of the world’s top manufacturers of outdoor equipment. Although the company has grown, one thing that has remained unchanged is their commitment to creating products that adhere to four core values of comfort, durability, design and versatility. From jackets and pants to slip-on shoes and runners, Merrell is dedicated to making products that look as good as they feel to wear. Whether you’re walking, running, hiking or climbing, Merrell’s rugged products are made to hold up regardless of where your adventures take you and stay strong in the face of repeated wear-and-tear. Merrell’s dedication to cutting-edge design is exemplified by the Thermo Rogue Mid GTX, the brand’s newest hiking boot. Built to keep you supported in harsh winter conditions, this streamlined boot offers the warmth and stability you need for hiking on cold, slippery trails without the bulk of a typical winter hiking boot. Every pair features 100 grams of Primaloft® Aerogel, which provides lightweight but effective insulation. GORE-TEX® waterproof membrane keeps your feet dry while also providing breathability and M Select™ FRESH antimicrobial agents help to minimize shoe odour.The Thermo Rogue Mid GTX also features Kinetic Fit™ BASE insoles for intuitive support, while the outsole includes new Vibram® Arctic Grip Dura technology – created to provide firm traction on ice, snow and other challenging winter conditions. 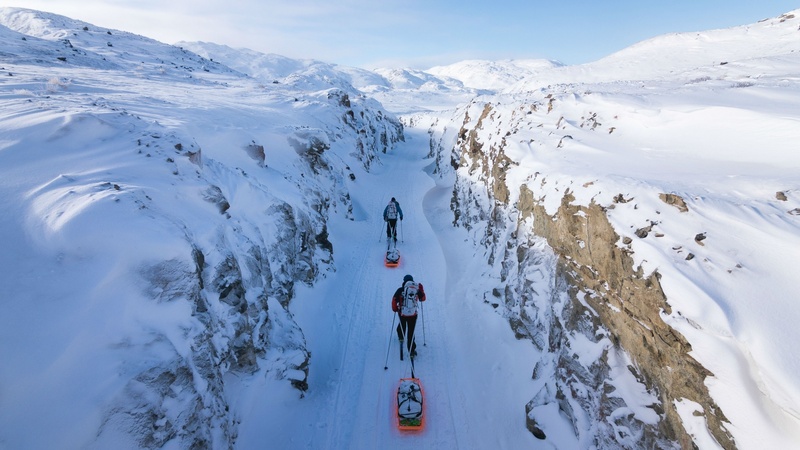 The Thermo Rogue Mid GTX boots’ exceptional performance on icy trails made it the natural choice for endurance athletes Mike Chambers and Jason Antin, who put the boot to the test traversing Greenland’s Arctic Circle Trail last March. 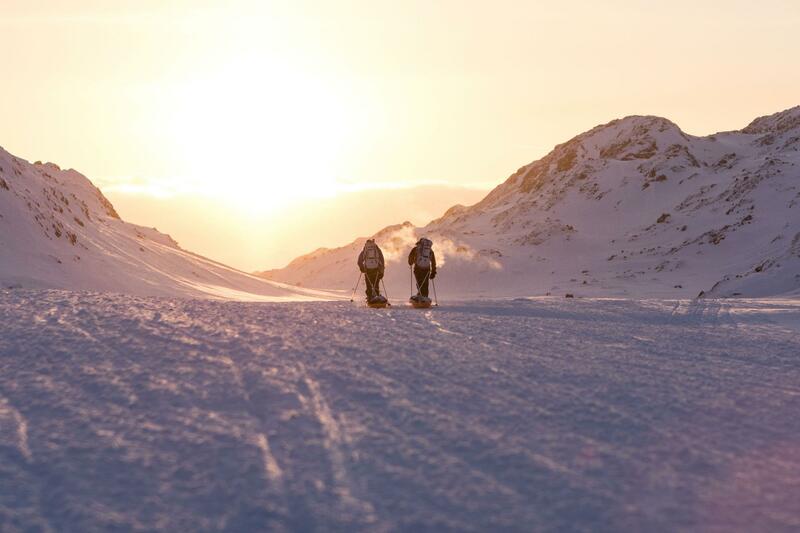 The pair travelled across 165 kilometres of terrain by ski and foot, over the course of just over 3 days. Fewer than 1,000 people are estimated to hike this difficult trail each year, but most complete the trek in the summer when conditions are milder. In the winter, when Chambers and Antin took on the trail, temperatures regularly drop as low as -28C. The pair wore the Thermo Rogue Mid GTX for this demanding trip, which made it easier for them to traverse particularly hard-packed sections of the trail. The Thermo Rogue Mid GTX redefines what outdoor enthusiasts have come to expect from heavy winter hiking boots with its sleek design and exceptional warmth. It’s just one of the many examples of how Merrell’s innovative products are making it easier than ever for everyone to get outside and embrace the great outdoors.